Your Courtyard maybe tiny but you can certainly make it big on impact. A well designed Courtyard can give your home the taste of outdoors, whilst simultaneously offering you the privacy of a great room within your home. Tiny Courtyards really are very intimate spaces, and so the design of the home, Courtyard and it's garden do need to integrate with each other if there is to be a seamless relationship between all three. Read more on Courtyard design here. In other blogs I have talked about specifics like connectivity, natural elements, focal points, lighting, color, plants, furniture, pots etc when considering landscape design for your Courtyard. Have a read of my blog "Garden Ideas for Small Spaces" and "Garden Ideas for Urban Living" for more of that detail. I am inspired by some of the creativity that is out there for Courtyard design and I want to share them here. 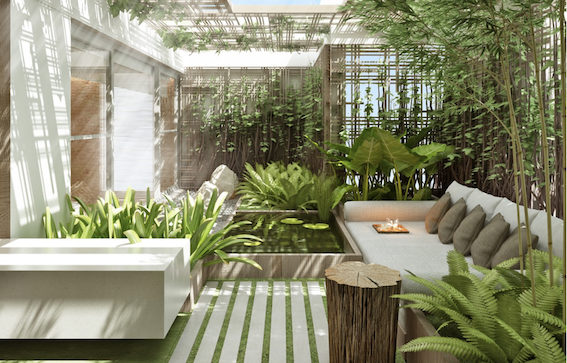 They are "big picture ideas" for contemporary styling, and I hope they will invite you to conceptualise the possibilities for your Courtyard garden design. Continue some of the internal architectural features out into the Courtyard. The architecture is seamless. The plants in this Courtyard, whilst not overstated or cluttered are big on impact. 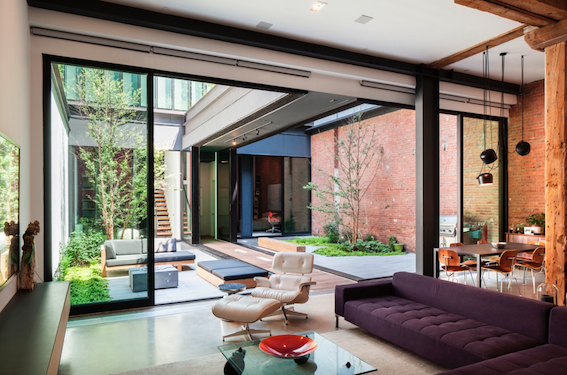 The vertical scale of the glass doors are complemented by the high courtyard walls and the height of the tree within the Courtyard. For those who want more greenery, the plants do become the hero. Adding a very small pond provides further serenity..
A very effective design that combines the kitchen and alfresco dining area within the one statement. Elegant minimilist Bamboo. Reach for the sky with this one. 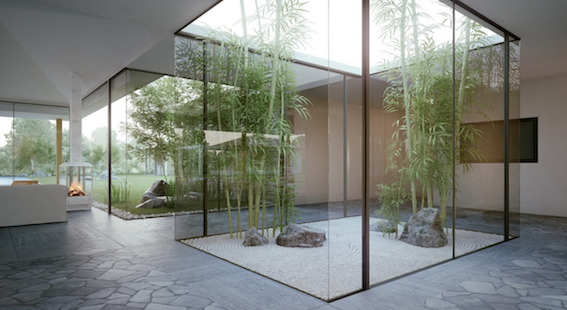 Or maybe just as elegant with a Japanese Maple when your Courtyard has good air circulation. The textures of the hardscape completes the dynamics of this Courtyard. All the rectangular lines in this Courtyard are relaxed with the soft wispy grasses. When the Courtyard has no depth, a bold color within the plant palette provides the drama. The architecture here allows for a degree of separation within the Courtyard for interest. Go on spoil yourself. Children do not live here! 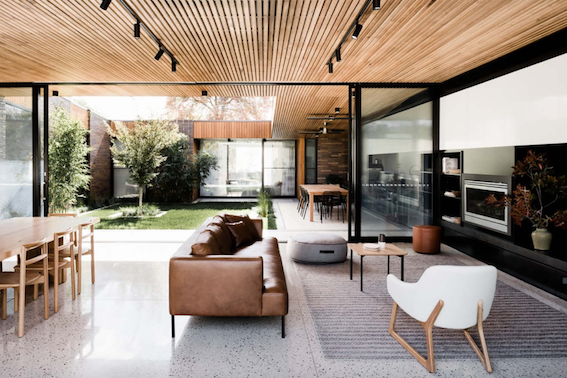 Have a look at these and other design ideas for your Courtyard, and if your inspired by just one of them, I am sure we can tailor that to your lifestyle, the architecture of your home, and your budget. Contact me now and let's make a time to get together.